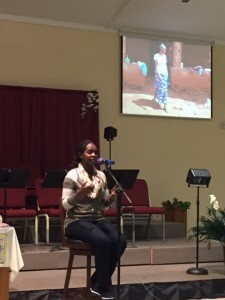 Irene Kamara’s stories about all the good works your generosity made possible during her recent mission trip to the Congo! As a result of her impact, homes were built, hundreds were dressed in new clothes and fed a Christmas dinner, boxes of medications were provided to the clinic, crutches were made for those in need, a girl’s support group was created, and a young man’s education was supported! Thank you Bob and Carol Moore for this information and photo. Mendon Church places a great emphasis on missions. We tithe at least 10% of our budget to missions work. More importantly, we take seriously our Church Mission statement to Invite all people, Nurture believers into disciples, and Demonstrate the Kingdom of God through life-service to others. We reach out with our time, talents, hearts, hands and prayers. 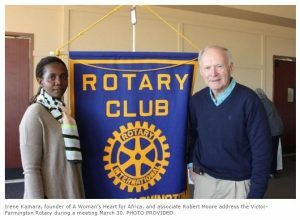 We believe it is important to reach out both to our local community and the world. We place an emphasis on hands-on projects and encourage all Church members to serve in our ministries and projects. We also encourage members to stand up and start their own projects with support from our faith community.